End results are slightly patchier the third series around with the new Doctor Who revamp. To recap: the Doctor (just that, no first name or surname) is a so-called time lord traveling through time and space, somehow managing to get into trouble each episode and having to battle all kinds of alien and other threats. It is of course a new version of the old TV series that ran a gazillion years on the BBC before being cancelled and only recently being revised with this new series, which boasts state-of-the-art special effects, sets and costumes (the old Doctor Who were always a punch line because of its cheesy zero-budget production values). 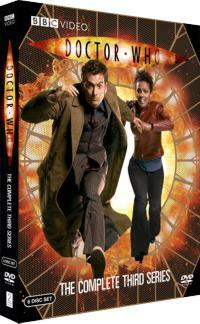 This particular series gets off to a wobbly start with an episode arc titled The Runaway Bride, co-starring Catherine Tate, a popular British comedienne, playing an unwilling companion to David Tennant's manic time-traveler character. Luckily the series finds its footing again, but these early episodes display what is the worst about this new reinvention of the beloved Doctor Who character, namely an over-reliance on formula in the guise of the Doctor waving his so-called ?sonic screwdriver? like a magic wand at anything he needs fixed in order to advance the plot and some bad, bad science. The science in Doctor Who has always been bad throughout the long decades, but in Runaway Bride nothing seems to make sense, right through from the magical screwdriver to an enormous spider-like creature with impractical pincers for hands; an alien species that seems incapable of piloting an advanced spaceship, never mind having the manual dexterity to have actually constructed one! The science in the episodes that follow aren't that hot either (an understatement), but at least the writers have kept usage of that deux ex machina sonic screwdriver to a minimum. The Runaway Bride is also hampered by the presence of Tate, a comedienne popular in Britain, whose character here simply comes across as abrasive and unlikable. Luckily she is replaced as Tennant's sidekick in the rest of the episodes by the very capable Freema Agyeman who turns out to much more agreeable. In fact the later episodes are thankfully much better than The Runaway Bride, some of them being actually darned good, especially an episode titled Blink and the three-parter that brings back the Doctor's old nemesis, the rogue time lord known as the Master. Low points include a storyline about the Daleks in Depression-era New York which is let down by some formulaic plotting and laughably bad make-up for a so-called human/Dalek hybrid. Still, the series? strengths do shine through in its acting, human interest, clever writing, up-to-date production values and sheer human interest. Purists may fume at the introduction of romance into the asexual Boy's Own world of the Doctor, but hey! We're all grown up now, aren't we? THE DISCS: Thrown into the mix is one of those stage show extravaganzas, now focusing on the show's music soundtrack (on disc one). The sixth disc contains only featurettes, which one should only check out after having watched all the episodes as they tend to spoil the show's surprises. WORTH IT? Some low points aside, this third season proves that the show is still going ? if only they can part the Doctor from that damned sonic screwdriver doo hickey thingy! Things are also nicely wrapped up towards the end, and the final episode sets up the next season. We for one can?t wait. RECOMMENDATION: Worth it. 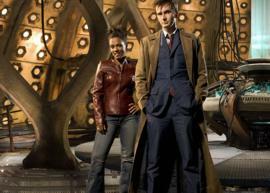 Doctor Who newbies should start out with the first series though.